Emily Phifer is a rising senior at Kutztown University majoring in Marketing and Management with minors in Entrepreneurship and Studio Art. 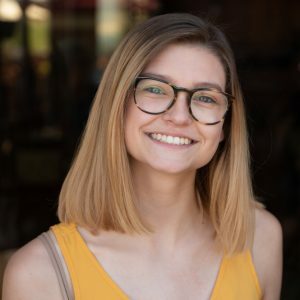 She is the Public Relations chair for the Performing Dance Portmanteau dance team at KU, and volunteers with Super T’s Mast Cell Foundation coordinating fundraising needs and social media communications. In her free time she is also an avid photographer. After graduation she hopes to enroll in West Chester’s graduate program for Nonprofit Administration. Emily Phifer started her communications and marketing internship with CCCF on July 2. Emily came to intern at the Carbon County Community Foundation through Carbon County Workforce Training office, which was awarded funding from the PA Department of Labor and Industry to support the 2018 State/Local Internship Program (PA SLIP) in our region. The program provides a paid internship to local college students for 8-weeks at government or nonprofit agencies. Emily’s focus will be on developing communications and marketing content to aid the Community Foundation in outreach activities. “My goal is to take the knowledge and skills I gain here forward with me after I graduate,” says Phifer. In the first two weeks of her internship, Emily has already accomplished much. Working with the Executive Director, Amber Breiner, Emily has undertaken a complete evaluation of the website that has strengthened existing content and will pave the way for future content development and its dissemination. “Emily is amazing. She’s very sharp and enthusiastic to get things done. I appreciate her ability to work with minimal direction to accomplish high-quality results,” says Breiner. She is a wonderful addition to the CCCF team and we’re doing all we can to help ensure that Emily will look back with pride on her internship experience with us. Thankfully, we know we won’t have to say goodbye at the end of the summer since Emily has pledged to join the 20/20 Circle and continue to advocate for the Foundation in the community.